At the Republican National Convention today, Clint Eastwood decided to be un-Conventional and brought Obama with him on-stage. 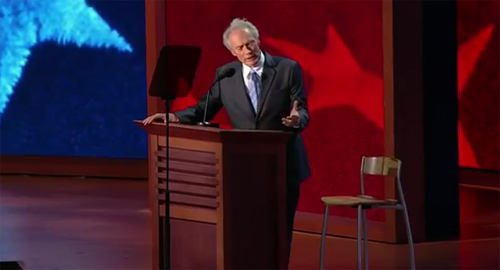 Or at least an empty chair supposed to stand-in for Obama. Almost immediately, the interwebz was abuzz with jeers for Eastwood; within moments, @InvisibleObama popped up on twitter and – as of this writing – gathered 34,909 followers. As savvy as Obama’s team is, this damn-near perfect twitpic response – captioned “This seat is taken” – was inevitable. Now, I enjoy trolling as much as anyone on the interwebz; certainly, Eastwood’s stunt lends itself perfectly to both appreciative – the audience seemed to love it, despite disparaging tweets by non-believers about how Eastwood was creeping even Republicans out – and derisive hilarity. However, as an avid student of communications, I have to admit to actually loving that speech. Yep. That’s exactly what he is: a movie tradesman. An actor. A professional who communicates with his audience with a fair amount of theatricality. There might be purists out there who would insist that certain forms of communication shouldn’t cross over into the political world where all the conversations should be high-browed and dripping with gravitas, so sure, they’re not gonna be happy. For the rest of us, however, it might be helpful to step back for a moment and realize that the point of communication is to connect with the audience and win them over to your side of the argument – or in this case, whip the choir up into a frenzy. Seen in that light, Eastwood’s act wasn’t stupid or out-of-place at all. He simply did what he did best, which was to entertain people while driving home his message of dissatisfaction at the Obama presidency.